Jeremy, the Jack-O’-Lantern HALLOWEEN SALE! I am pleased to announce that now through October 31st, my children’s picture book, Jeremy, the Jack-O’-Lantern is being sold at a huge 25% discount exclusively through Lulu.com. Grab it now for only $7.50! This book is printed on demand, so there is no worry of it selling out. Please share this post with your friends and family! What does a pumpkin think about being turned into a jack-o’-lantern? Join Jeremy as he goes from a small pumpkin on a vine to a delightfully wicked jack-o’-lantern! Go on a journey as Jeremy experiences Halloween for the first time! Dead Skin Dave one year Anniversary! Ahoy, mateys! In a few short weeks, it shall be one year since the release of Dead Skin Dave, the Pirate! To commemorate, the paperback copy of the book will be on sale for a limited time starting pretty much as soon as you read this! As always, you get the e-book FREE when ordering the paperback through Amazon.com! Be sure to check out all of my Junior Pirate activities by clicking the Dead Skin Dave tab on the menu! Now is a great time to buy or order a few extra copies for your friends, family, co workers, church, neighbors, homeless guy down the street, your post man…. Once upon a time , there was a short, skin-peeling mess of a pirate known to the world as Dead Skin Dave. Dave wanted nothing more than to impress his fellow pirates, but he rarely succeeded. Then one day, the feared Hairy Hazelroth sank his ship and left him stranded on an island full of wanna-be pirates! Join Dead Skin Dave, the Pirate, his dim-witted first mate, Tom Swiftfellow, and the evil Hairy Hazelroth, as they face off across the high seas for the legendary lost cutlass o’ Captain Bo Ben in an adventure full of laughs and swashbuckling action! I have a few stories cooking up in my head, and I need your help in deciding which to write next! What if I told you there was a book equivalent of The Goonies with a bit of Stand By Me thrown in there. And what if I told you it was a coming of age story that dealt with realistic kids? No super powers or vampires. 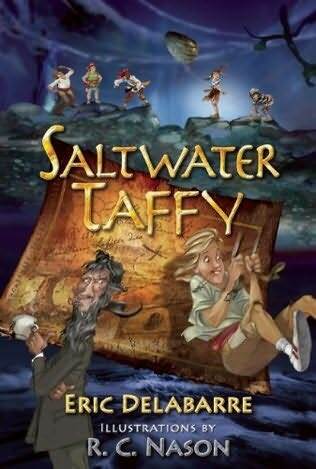 Well my friends, that book exists, and it is called Saltwater Taffy by Eric DelaBarre. Why it is a fantastic adventure: Friendships are the lifeblood of our youth. They are what keep kids going. They live for after school and the weekend, when bike rides lead to adventures and the only limit is imagination. Your kids will undoubtedly value their friends more after reading this story. This story takes place in the 1970s, before cell phones, Internet, computers, etc. If anything, your kids will be able to read about a time when life was a bit simpler. This will hopefully inspire them to get out of the house more often and go explore the town with their friends. Treasure hunting is something that excites all of us. Whether we’re kids, tween,s teens, adults or seniors, we have all been bitten by a treasure hunting bug at least once. The story in this book will ignite your kids’ imaginations. Get ready to create your own treasure hunt because as soon as they are done reading this book, your kids will be pumped for an adventure – and what better way then with a treasure hunt! This book really hits a lot of great themes in a young person’s life. I’ve told you about the friendship aspect. There is also a great lesson about learning to stop aiming so high because what you want is probably right in front of your face. This is always a great lesson to teach kids and is a great reminder for adults. Be happy with what you have! Loss of someone close to you is also dealt with in this book, and it is not just a tug at the emotions, but a great way to open dialogue with your kids about loss and what it really means. I originally heard about this book when Tim Burton was rumored to be directing it’s feature film adaptation. Of course that caused me to immediately click the Buy button on my Kindle and begin reading. 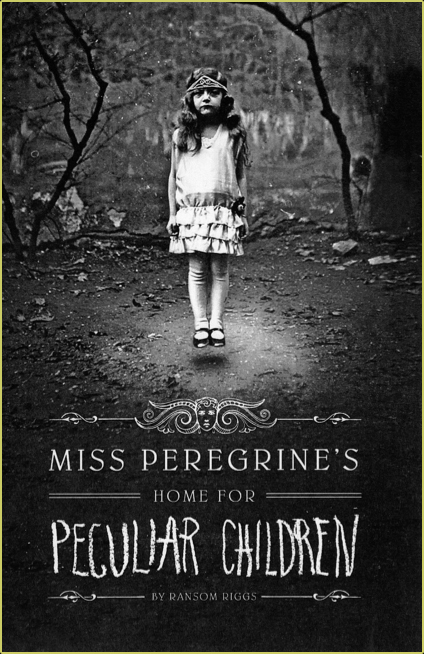 For a book with the words ‘Home for Peculiar Children’ in the title one would expect a fantastical world inhabited with imaginative creatures. In fact, the book starts out in a very normal way inhabited by very normal people. The story centers around Jacob, an angsty teenager who wishes he could leave his simple little home town and family behind for grand adventures. As a child he was close to his grandfather, Abe, who used to tell him stories and show him pictures of peculiar children. One could lift heavy objects with ease, another was invisible, and so on. These stories used to be Jacob’s favorite things in the entire world. Until, of course, he grew up and realized that they all had to be made up lies. It is only when he witnesses his grandfather’s death by a pack of vicious, mythical creatures, that Jacob begins to wonder if the stories were true. Of course, witnessing his grandfather’s grisly demise is extremely traumatic, so his parents send him to counseling to deal with the loss. And then things get weird. Jacob’s grandfather, Abe, gave him a clue as he lay dying. Jacob thought not much of it until he realized it had to do with the stories he was told as a child. After all, if those strange creatures that had killed his grandfather actually exist, why couldn’t these kids? He becomes so obsessed that his psychologist convinces his parents he needs to visit the orphanage on a small island off the coast of Wales where his grandfather grew up in order to restore his sanity. Soon after Jacob visits the remains of the destroyed orphanage, he finds himself journeying through a time loop where- surprise -the kids actually do exist and Abe was one of them. The rest of the story is yours to discover. I do not want to spoil anything, just get you hungry for the rest of the meal. Time loops, humans who turn into birds, a girl who can create fire in her hands, evil creatures called wights – all of these and more await you on Jacob’s journey to discover the peculiar past of his grandfather. Ransom Riggs, the author, creates stunningly vivid landscapes with just a few simple words. You are certain to get sucked straight into the locales in this story. As I said previously, the book starts off in a completely different direction than I would have expected, and I feel it takes a tad too long to enter the world of peculiar children, but with a sequel out now, it makes sense to prolong the journey in the first book to get more miles out of the second. The pacing feels a bit bogged down in the beginning and then just breaks away in the later parts of the book. The characters are fleshed out very well, giving each an endearing quality or, in the case of the bad guys, much to loath. Riggs goes beyond the static descriptions – “here’s the kid who can lift heavy stuff, here’s the invisible guy, here’s the shapeshifter” – and turns them into living, vibrant characters. I was not expecting it to end on a cliffhanger, so I was quite surprised with the final direction of the story and wonder where else this story can go for another novel. In any case, it will be delightful to enter the world of Miss Peregrine and her peculiar children and see just which direction the story will go. 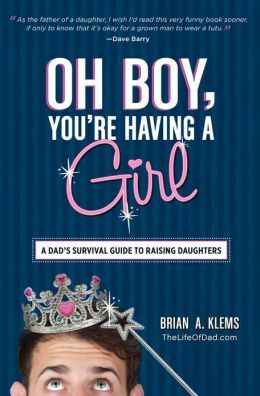 I highly recommend this book for the young adult in your household, and the parents, too. (You have to know what you’re kids are reading, right?) There are some more grown up themes like death, murder… angst. So keep this one away from the kiddos for a while. Hello, folks! I know I said I’d take the day off, but Amazon just launched a great promotion that I would like to share with you. Starting today, all purchases of the paperback version of Dead Skin Dave, the Pirate! will allow you to download the eBook for your Kindle device or app absolutely FREE! Now you can take Dead Skin Dave with you wherever you go! Let your kids read it on your iPad, smartphone or Kindle device It’s a great way to always keep your kids reading! Just add the book to your cart, checkout and the eBook version will be made available to you for free.